Oh my goodness, you’re going to love this soap! First, it’s BEAUTIFUL. It looks dark in this picture, but it’s really a gorgeous Caribbean blue with pearly white swirls. It smells like a fresh summer breeze, with just a hint of coconut. It feels wonderful on the skin and we are so happy to add this to our line up of premium soaps. 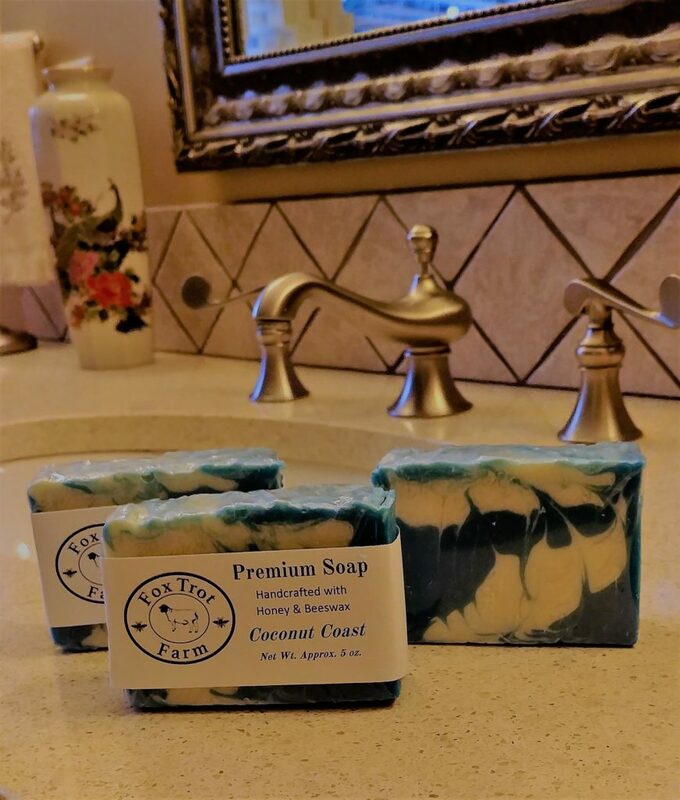 Whether you use it in the shower, by the sink for a gentle facial soap, or in the guest bath to add a beautiful and aromatic accent, you will love having this soap in your house! Choose from a colorful array of hand made cotton wash cloths to accompany your soaps, and lovely soap dishes made by a local potter. 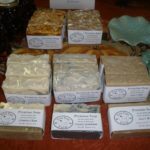 Come see us today, Sunday, July 30, from 1:00-5:00 to stock up on this new soap as well as many of our most popular soaps. We have Country Gentleman back in stock, as well as Mother Earth, Gardener’s, Patchouli Oil, and others. Also in the market today are our very own packages of lamb, raised on our farm and processed in a certified humane and USDA inspected facility, our own fresh blue and brown eggs, Granny Bee’s raw honey, and quilted and hand crafted items. Arrive a bit before 2:00 and take our guided farm tour. It’s going to be a beautiful day on Fox Trot Farm!